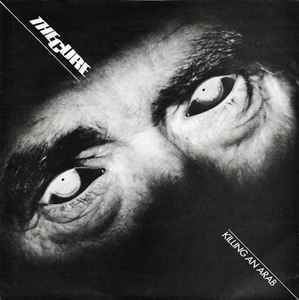 First single from The Cure released in December 1978 on Small Wonder Records. Two months later, it was reissued in UK on Fiction Records, the new label created by Chris Parry, and in Ireland on Polydor. The lyrics of "Killing An Arab" are inspired by a scene from the book "L'Etranger" (The Stranger) by Albert Camus. Emblinded by the desert light, Meursault takes a flask for a gun and kills mistakenly a Bedouin. In 1979, the book "The Stranger" was sent to medias by Polydor during the promo campaign. "The song Killing An Arab has absolutely no racist overtones whatsover. It is a song wich decries the existence of all prejudice and consequent violence. The Cure condemn its use in furthering anti-Arab feeling." The song was renamed as "Kissing An Arab" through the summer festivals 2005. In 2011, it became "Killing Another" on their Bestival live LP. All versions say "15000 copies pressed". Is that implying 15000 in total across all the issues? Or 15000 of each? Assuming the former does anyone know how many copies were pressed on Small Wonder? Styrene injection moulded labels have a tint of blue and not silver. Hard to spot what the difference is between 'Styrene' labels and 'silver injection' labels. Anyone? Or is this an attempt to make a separate issue out of absolutely nothing ?! Yes Ian, my version is P1978 with Fiction silver injection moulded label, with exactly the same small wonder cover. My version is P1978 with Fiction silver injection moulded label, but in a small wonder cover, with dripping tap on the back cover. Does any one else have the same? My version of this is released in 1978.